I'm posting this on February 12th, which isn't ideal for Valentine's Day making. But I really did make this last night and take the pictures today. Just to show you that you really can make this in a hurry. And if you find this after Valentine's Day, you can still give this as a gift for someone sweet anytime. 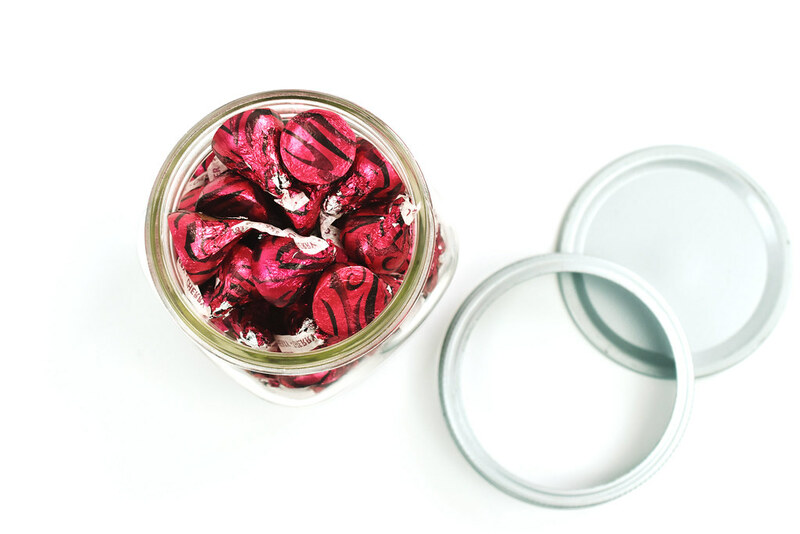 Think teacher or thank you gifts, or you could even save it for Sweethearts day. At any rate, it's fast and fun, and you can fill it with lots of cherry goodness! 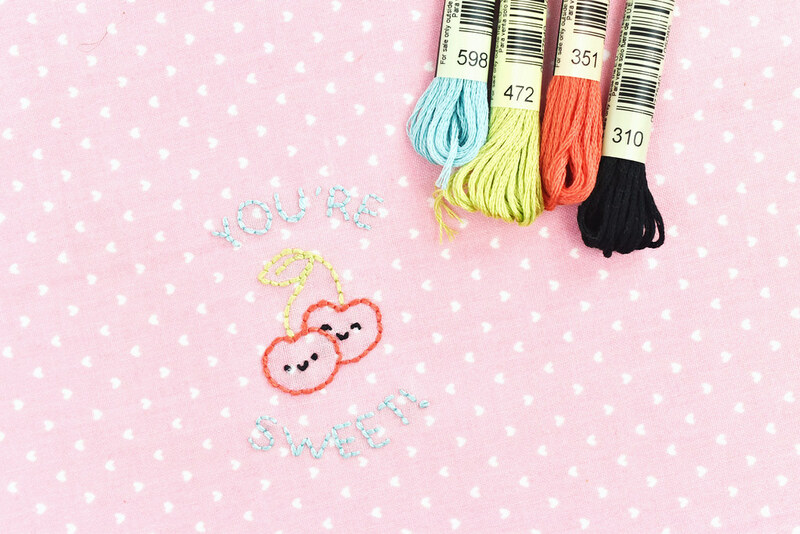 Transfer the embroidery pattern on your fabric and stitch the design. I used 3 strands of floss throughout. I used back stitch for all the outlines, french knots for the regular eyes, and scallop stitch for the smiles and smiling eyes. The pattern is sized to fit a wide-mouth canning jar lid, but if you want to use a standard size lid, print the pattern out at 75%. Find something that can work as a round template. 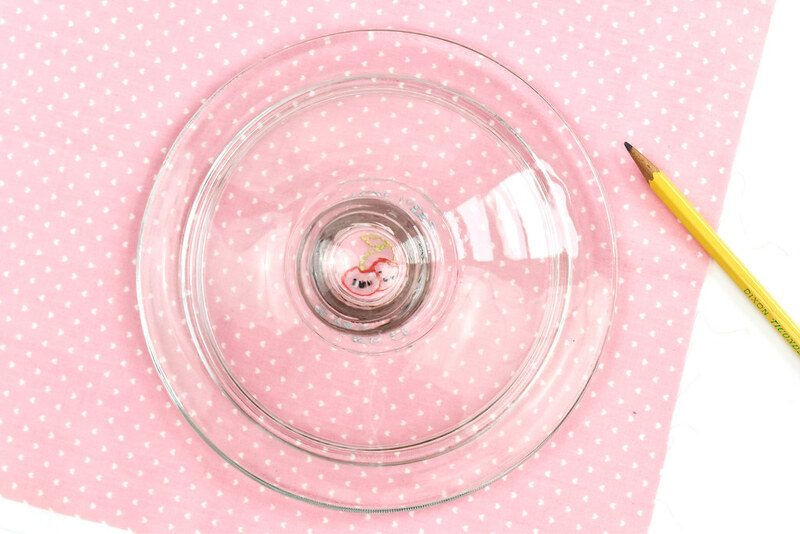 You want the circle to be a few inches larger than the lid of your canning jar. For mine, I used a lid that's about 7" in diameter. Trace around the template with the embroidered in the center. 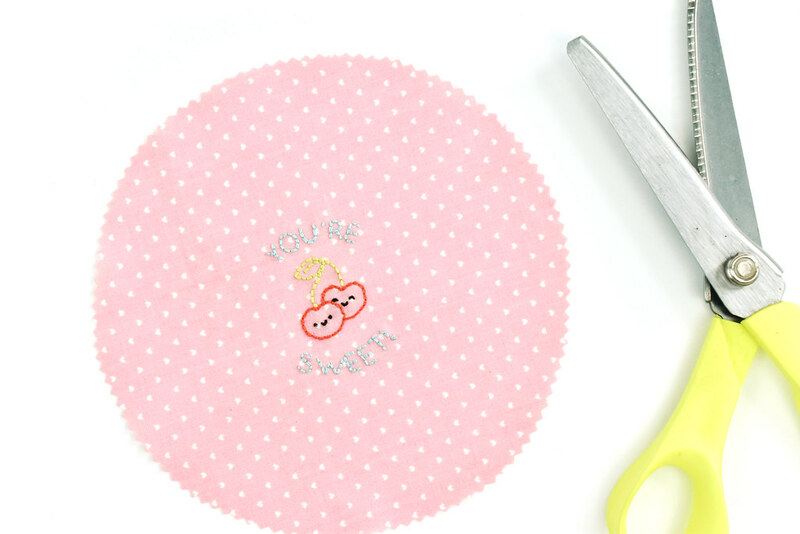 Cut out the circle with pinking shears. ...You get the idea! 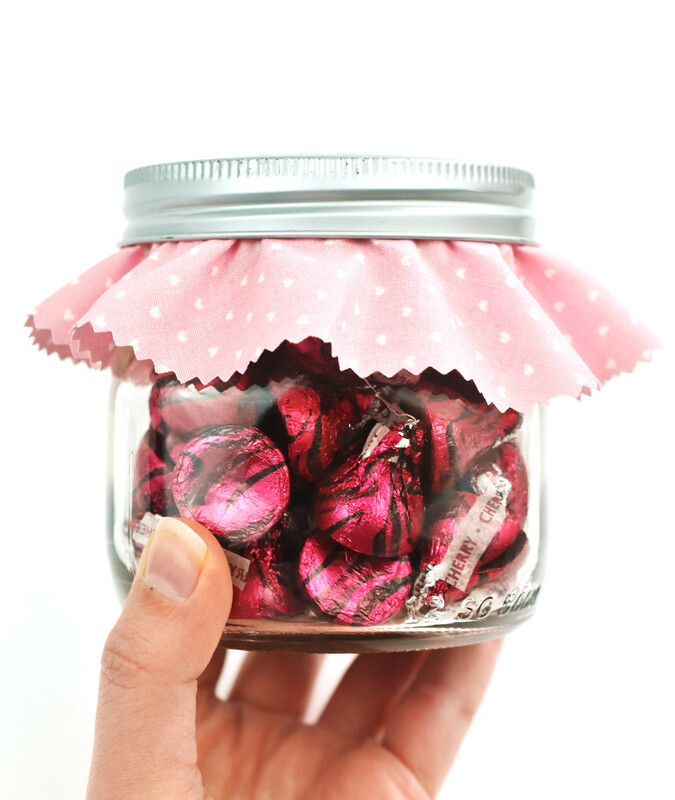 If you don't want to give candy, you could also fill the jar with notes. Because what's sweeter than kind (or romantic!) words? 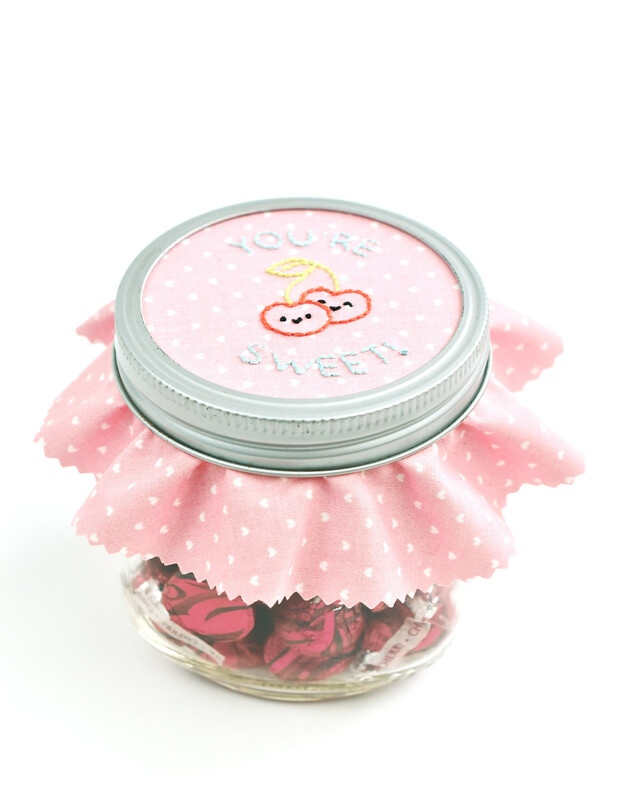 Place the solid lid on the jar, then cover it with your embroidered circle. Hold the fabric in place with the embroidery centered on the lid. You do need to hold it as you screw the ring on the jar, because it will shift otherwise. 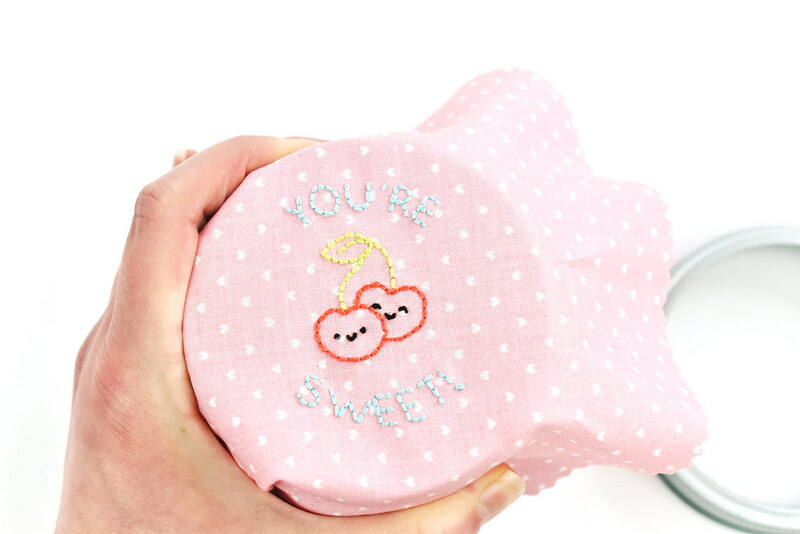 Once the ring is in place, you're ready to give this cherry sweet gift! 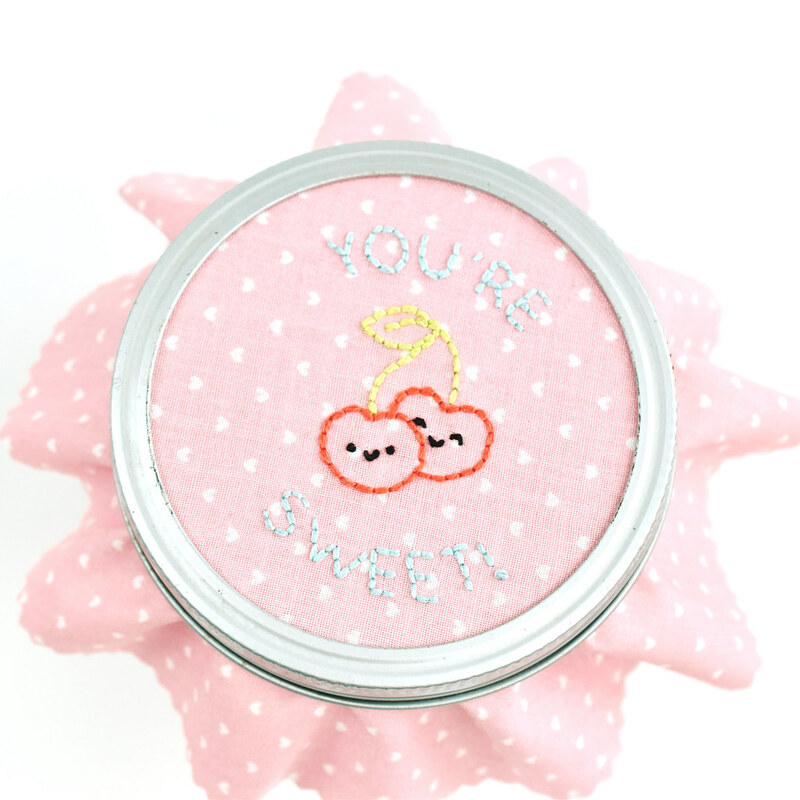 Of course, you could use this pattern to make other items, like cards or little pins. 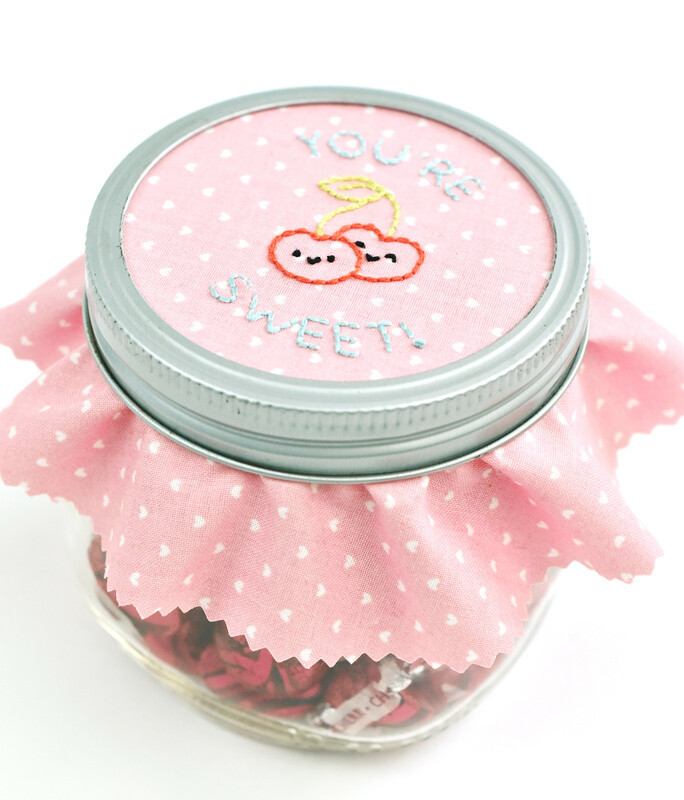 I even think you could use cherry-scented air freshener beads in this jar, and just leave out the solid jar lid. What do you think? Oh, and for my Jam of the Month Stitching Club friends, this ISN'T the monthly pattern for the EPP project. That's still coming, but I wanted to use part of the design to make something else fun! What will you fill your jar with and who are you going to gift it to? Great post, thanks for this! I have only one word AMAZING! I love this idea for jars of homemade jam too!